Even though I'm 24 weeks pregnant, I just started knitting the first thing for Lil' J last week. During my first trimester, I was so exhausted that knitting did not appeal to me, instead I wanted to sleep. When my second trimester started, it was time to think more about Christmas knitting. 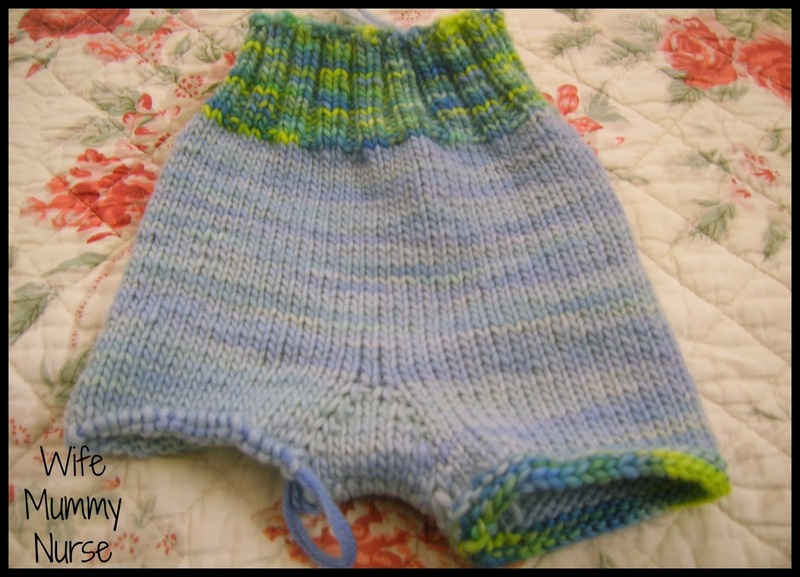 So I was thrilled when I cast on the Tiny Pants shorties last week. They're almost finished. I cast on 72 stitches on the waist band and increased the body by four stitches. I'm knitting it with Manos del Uruguay Maxima yarn. The aqua colorway is leftover from a pair of longies I knit last year. I bought the stratus colorway at Wolf Creek Yarns on Black Friday for 30%. They had AMAZING Black Friday sales. Aw!! It's Going To Be Adorable, Congratulations!! I don't know how to knit, but it's on my to do list so I can do cute things like this!